WASHINGTON, DC, August 2, 2010 (ENS) – To break up accumulations of oil spilled into the Gulf of Mexico, BP used chemical dispersants far in excess of federal environmental guidelines, Congressman Ed Markey, a Massachusetts Democrat, alleged Sunday. Markey, who chairs the House Energy and Environment Subcommittee, released a letter he sent to National Incident Commander retired Coast Guard Admiral Thad Allen with documents showing that the Coast Guard, tasked with limiting BP’s use of toxic dispersants during the disaster, repeatedly allowed the oil company to use excessive amounts of the chemical, Corexit 9500A. “BP carpet bombed the ocean with these chemicals, and the Coast Guard allowed them to do it,” said Markey. On May 17, Markey wrote to the U.S. Environmental Protection Agency raising concerns about the use of unprecedented volumes of dispersant in the gulf, concerned that the chemical had not undergone a thorough review of its toxicity or effects. Following a rapid analysis by the EPA, on May 26 the agency, along with the Coast Guard, directed BP to completely eliminate surface application of the chemicals except in “rare cases” for which exemptions had to be requested. Yet following that directive, Markey’s analysis shows that more than 74 exemption requests were sent daily to the Coast Guard by BP and the Houma Unified Command, and all of them were approved by the Coast Guard, usually within the same day. The approvals were granted despite concerns raised by the EPA that the exemptions were being approved on a pro forma rather than rare basis, and that these approvals were occurring without the specific data and justification required, Markey alleges. Markey’s analysis found that the amounts of surface dispersants used that were reported by BP to Congress vary widely from the amounts reported to have been used in BP’s requests for approval by the Coast Guard. Markey says this discrepancy brings into question whether BP was being truthful about the total amount used, and whether the Coast Guard was conducting rigorous monitoring and oversight over the company’s use of the chemical. For example, Markey cites one approval request from BP executive Doug Suttles, who claimed that the maximum daily application of dispersant on the surface on June 12 was 3,360 gallons. 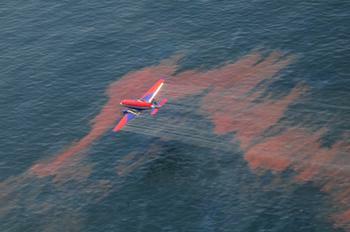 However, an examination of the dispersant totals BP provided to congressional staff in its daily “Gulf of Mexico Oil Spill Response Updates” indicates that on June 11, BP said it applied 14,305 gallons of the chemical on the surface; on June 13, 36,000 gallons; and on June 14, the company reported using 10,706 gallons. According to publicly disclosed figures on DeepwaterHorizonResponse.com, more than 1.8 million gallons of dispersant were used to break up the oil as it came out of the blown-out Deepwater Horizon well, as well as after it reached the ocean surface. Markey now questions the validity of that number. We established a goal to reduce dispersant use by 75 percent, Allen said. At the time the capping stack went on, July 15, he said the use of dispersants had been reduced to 72 percent of previous levels. Today, the EPA released peer reviewed results from the second phase of its independent toxicity testing on mixtures of eight oil dispersants with Louisiana sweet crude oil, the type of oil spilled by BP. The results confirm that the dispersant used in response to the oil spill in the gulf, Corexit 9500A, when mixed with oil, is generally no more or less toxic than mixtures with the other available alternatives. The results also indicate that dispersant-oil mixtures are generally no more toxic to the aquatic test species than oil alone. “EPA has committed to following the science at every stage of this response – that’s why we required BP to launch a rigorous dispersant monitoring program, why we directed BP to analyze potential alternatives and why EPA undertook this independent analysis of dispersant products,” said EPA Administrator Lisa Jackson. “We have said all along that the use of dispersant presents environmental tradeoffs, which is why we took steps to ensure other response efforts were prioritized above dispersant use and to dramatically cut dispersant use,” Jackson said. While there has been virtually no dispersant use since the well was capped on July 15  only 200 gallons total applied on July 19  EPA’s environmental monitoring continues.